Known as the "Waldorf Astoria of Harlem," the Hotel Theresa was a central location for black life in New York City during the middle of the 20th century. 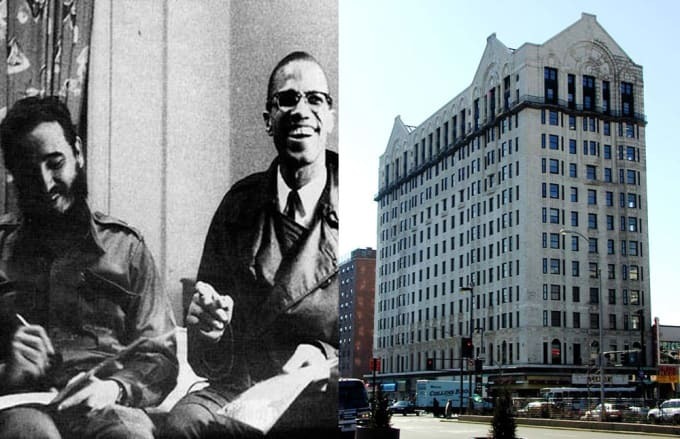 During the early 1960's, Malcolm X met Fidel Castro there while Castro was in town for an early United Nations session. In addition to meeting Cassius Clay there several times, X also organized his Organization of Afro-American Unity (OAAU) there and held the meetings at the hotel. Once the city became desegregated, blacks had more options, drawing them away from the Hotel Theresa. It closed in 1967, but was re-opened and turned into an office building in 1971. Now known as the Theresa Towers, the building still wears its old name in ancient paint along the side of the hotel. It serves as an additional campus for Teachers College, Columbia University, and the Touro College of Pharmacy. It's also the World Wide Headquarters of Preferred Funding & Claim Management. Back in 1993, the city of New York recognized the building as a landmark.